My 12 year old niece's love to bake and will only use Betty Crocker. We live in NY but I thought it would be nice to take a tour of the Betty Crocker kitchens. From what I see there is no such thing anymore. Is that true? Is there a museum or something we can visit? 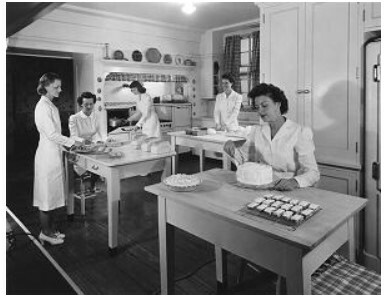 How fun it would have been to be one of the lucky ones who took a tour of the Betty Crocker Kitchens! Many people tell us they have fond memories of this little glimpse into the life of Betty Crocker. The tours were conducted from 1947 until 1985, and about 1.5 million visitors peeked into the famous kitchens during that time. The tours began with a multimedia presentation in the company auditorium, followed by a glimpse of Betty's official portraits, the cookbook library, and the formal Betty Crocker Dining Room. After viewing all of the seven kitchens, visitors received a "goody bag" of recipes, gadgets and products. I hope that has helped you. Thank you for writing.